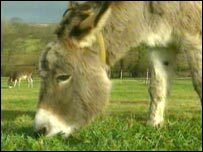 Villagers in Gloucestershire are trying to raise money to buy a donkey - to help them get their shopping home. Parts of Chalford, near Stroud, are so steep that residents cannot drive their cars up the narrow paths to the doors of their homes. Instead they have to carry heavy bags 100 metres up the steep slopes. Resident Anna Usborne said she had spoken to a sanctuary and a donkey may cost £600. She said: "Historically, the village has always had donkeys." She added: "There are pictures from the 1930s of donkeys delivering bread. We are close to a canal and donkeys also used to deliver coal." Explaining the campaign, she said: "Chalford is on a very steep bank and there's a network of paths by which people can arrive to their houses so they don't have any vehicle access, and some people have to lug their shopping 100 metres up the hill. "We are trying to raise money to either buy a donkey or hoping somebody will donate one." The idea, first suggested in a community group newsletter, has won the support of homeowners, some of whom suggest cars in the area should be banned altogether in favour of the animals. The item in the Chalford Community Stores newsletter said: "In true traditional Chalford style, we are considering making some deliveries using a donkey - yes a donkey. Dave Andrews, who lives on Rack Hill, said the entire village was backing the campaign to "bring back the Chalford Donkey". "Some residents have resorted to ordering their shopping to be delivered from supermarkets but we don't want their vans turning up in our village. We would much rather get our stuff up with the help of a donkey.